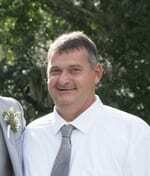 Kenneth Chambers, 50, of Dawsonville passed away Sunday January 6, 2019 at Northside Hospital Forsyth following a period of declining health. Born March 16, 1968, Kenneth was a lifelong resident of Dawson County. A loving father, son, brother and grandfather, he was preceded in death by his mother, Carolyn Chambers. Surviving are his children, Anna Berkley of Dawsonville, Amanda and Kevin Roberts of Woodstock, Jay and Lindsey Chambers of Florida; grandsons, William and Corey Roberts; father, Curtis Chambers of Dawsonville; brothers and sisters in law, Wesley and Rosalind Chambers, Jeff and Shelley Chambers, Greg Chambers, all of Dawsonville; sister and brother in law, Sheila and Charles Grizzle of Dahlonega; a number of nieces, nephews and other relatives. Memorial services will be held on Thursday January 10, 2019 at 2 p.m. at Bearden Funeral Home Chapel. Rev. Tommy Ross will officiate. The family will receive friends on Thursday from 1 p.m. until the hour of service.